Note the black stroma within the sunken canker. Photo by Jay W. Pscheidt, 1990. This branch has been girdled causing the leaves beyond the canker to die. This heavily infected orchard has many dead and dying branches. 'Jefferson' hazelnut with EFB. Note that there are no stroma but there is perennial infection of the trunk. This Turkish hazelnut (Corylus colurna) has classic EFB symptoms. Eastern filbert blight is also a disease on the ornamental contorted filbert. Photo by Jay W. Pscheidt, 1996. Red Dragon, a contorted filbert with red leaves and the single dominant gene for Eastern Filbert Blight resistance. Cause Anisogramma anomala, a fungus that has infected hazelnut orchards throughout the Pacific Northwest. The fungus has a life cycle of 2 or more years including a 12- to 15-month latent period when no symptoms are visible. In spring, spores are forcibly ejected and released in a sticky, white ooze in wet weather. Wind-driven rain and splashing droplets spread spores to young, developing shoots. Infection occurs in wet weather from budbreak through shoot elongation. Spores penetrate immature epidermal cells in the region behind the meristem where cell elongation occurs. Neither wounds nor natural openings on hazelnut trees have been shown to serve as sites of entry for the fungus, and it is not spread through the nuts. Stroma begin to develop the second summer after infection. Ascospores begin to mature in fall as the rainy season begins. Several hours of continuous rain are needed for ascospore release. Stroma will continue to sporulate, even after the diseased branch has been removed from the tree, until the canker dries out completely. Ascospores are shed all winter but cannot infect hazelnuts until spring. 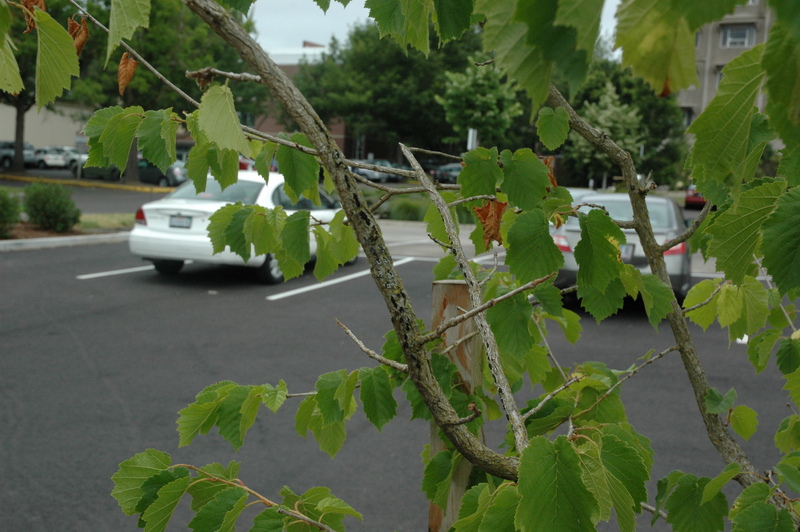 Cankers on large scaffold limbs, trunks or resistant cultivars may not produce stroma. New stroma develop each year as the canker continues to expand along and around the branch. Numerous new infections also occur each succeeding year. The pollenizer 'Daviana' and the cultivars Ennis and Du Chilly are highly susceptible to this disease. 'Casina' is susceptible as is 'Negret' and most wild or escaped seedlings. The main industry cultivars Barcelona, Butler, Hall's Giant, and Willamette have intermediate susceptibility. 'Lewis' and 'Clark' have quantitative resistance but can become infected through repeated exposure to EFB. 'Dorris', 'Jefferson', 'McDonald', 'PollyO', 'Santiam', 'Wepster', and 'Yamhill' are highly resistant with the single dominant-resistance gene from 'Gasaway'. These cultivars may get cankers but at a low frequency, be smaller, and may not produce spores. Some, but not all, of these cankers will heal over in succeeding years. The Turkish hazel (C. colurna) has resistance to EFB. 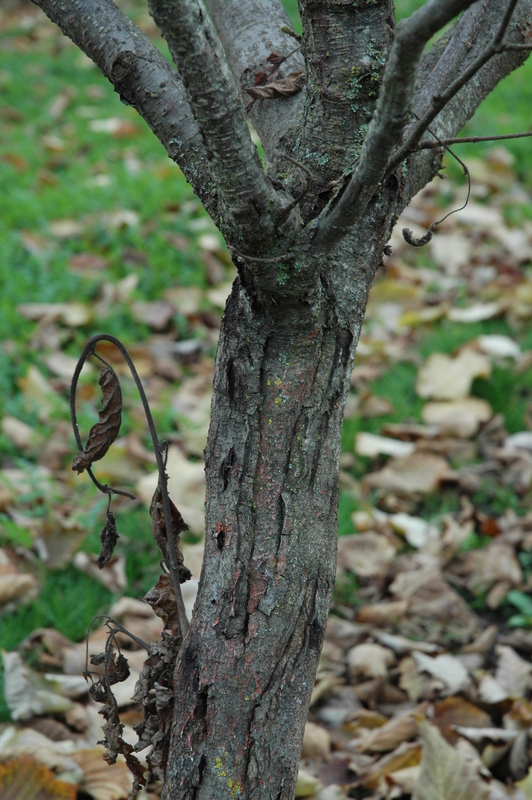 Although contorted ornamental hazelnuts can also be infected, the ornamental cultivars 'Burgundy Lace' and 'Red Dragon' have the single dominant-resistance gene from 'Gasaway'. The native Corylus cornuta var. californica and C. cornuta var. cornuta do not appear susceptible to the disease. Strains of Anisogramma anomala from Eastern North America can overcome the single dominant-resistance gene bred into new cultivars. There are restrictions in Oregon on commercial and ornamental hazelnut cultivars imported from out-of-state (OAR 603-052-0825). 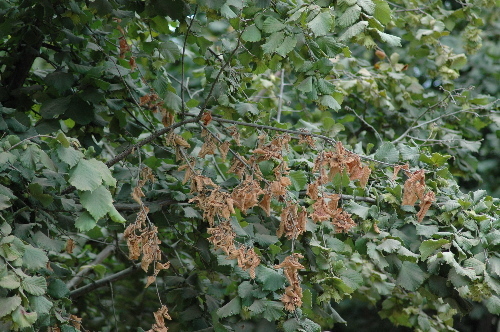 Symptoms Infected branches may die suddenly from July to September. Dead leaves may stay on the branch. Elongated, raised bumps begin to form on infected twigs and branches in June. When the bark is removed, the cambium below the bumps is chocolate-brown. Bumps continue to expand until the fungus breaks through the outer bark in July and August. A white, oval to football-shape fungal structure called a stroma can be seen then. As the stroma matures from August to October, it turns black and raises about 0.12 inch above the branch. Stromata are in relatively straight rows lengthwise along the branch. Cankers enlarge along the branch each year, from a few inches on small branches up to 3 ft on larger branches of susceptible trees. Branches die back when expanding cankers girdle branches and limbs. Most of the canopy of susceptible trees is usually dead within 7 to 15 years after the first infection (if diseased limbs are not removed). Suckers, however, may be produced for many years. Although orchards decline in vigor and health, they may continue to be productive. Tree productivity declines slowly at first but then sharply after 3 to 10 years depending on the cultivar. At some point the orchard becomes economically unproductive as the more susceptible pollinizers or main cultivars die out, resulting in poor nut set. 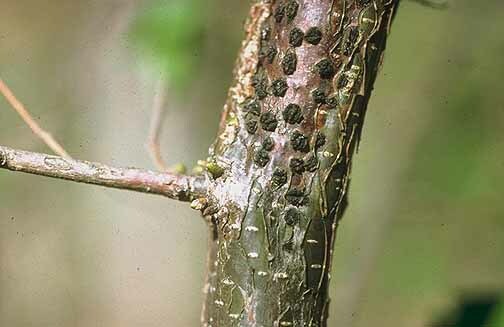 The disease may be confused with Eutypella cerviculata, which produces smaller black fruiting bodies on dead branches. This fungus produces diagnostic black rings under the bark, which can be detected using a pocket knife. Cicada egg laying scars can also look somewhat like eastern filbert blight but are not black and look stitched. Cultural control An integrated approach using several cultural and chemical techniques is needed for adequate disease control. Scouting for cankers twice a year is very useful; early detection aids overall control. Thoroughly inspect new orchards for 2 years after planting to find trees that may have been infected prior to planting. Replace susceptible pollenizers with highly resistant ones such as the VR series, 'Gamma' (compatible with 'Barcelona'), 'York', 'Felix' (compatible with 'Ennis'), 'Delta', 'Epsilon' or 'Zeta' all of which have the single dominant-resistance gene from 'Gasaway'. Also, reduce the number of susceptible pollenizers to 4% or 5% of the trees in the orchard. Remove or destroy escaped seedlings and trees beyond the orchard perimeter. Remove infected branches 1 to 3 ft below cankered area, and burn, bury or chip before budbreak in spring. Remove severely infected trees. Start sucker control early in the season. Chemical control A total of four (4) applications is recommended to adequately protect trees. Apply starting at budswell to budbreak and continue at 2-week intervals to cover an 8-week period. Thorough coverage of all branches is essential. Spray each row; however, for the first application only, alternate row applications may provide acceptable coverage. The disease kills trees slowly, so the yield benefits obtained from fungicidal protection are not realized for 3-to-4 years after application. Alternate or tank-mix fungicides from different groups with different modes of action. The addition of a surfactant, if allowed by the label, will improve disease control. Cultivars, such as Jefferson or McDonald, with the single dominate gene for resistance need protection at least the first spring after planting when located near heavily infected orchards. Abound at 12 fl oz/A. Use as a protectant only on a 10-day schedule. Do not use within 45 days of harvest or with silicone-based surfactants. Sprayers should not be used on apples. Moderate control. Group 11 fungicide. 4-hr reentry. Aframe Plus at 14 to 21 fl oz/A. Do not use within 60 days of harvest. Sprayers should not be used on apples. Group 3 + 11 fungicide. 12-hr reentry. Bravo Weather Stik at 4 pints/A (Bravo Ultrex is also registered). Do not use with other fungicides, a surfactant, or within 120 days of harvest. 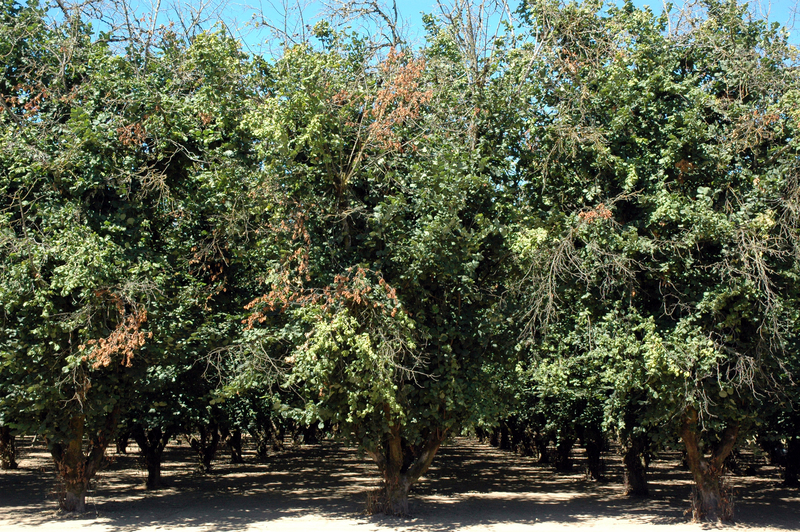 May increase low-vigor trees' susceptibility to summer sunburn. Excellent control. Group M5 fungicide. 12-hr reentry. Cabrio EG at 9.5 oz/A plus a spreader-sticker. Excellent protection and some curative activity. Group 11 fungicide. 12-hr reentry. Bordeaux 6-6-100. Caution Spray may burn young foliage. Champ Dry Prill at 10.67 to 16 lb/A with 1 pint superior-type oil/100 gal water. 48-hr reentry. CS 2005 at 64 to 128 oz/A. 48-hr reentry. Cuprofix Ultra 40 Disperss at 10 to 15 lb/A. Oregon and Washington only. 48-hr reentry. Kocide 3000 at 7 to 10.5 lb/A plus 1 pint superior-type oil/100 gal water. 48-hr reentry. Nordox 75 WG at 8 to 13 lb/A. 12-hr reentry. Nu-Cop 50DF at 8 to 12 lb/A with 1 pint superior-type oil/100 gal water. 48-hr reentry. Echo 90 DF at 3.25 lb/A. Can be applied with other products if mix is non-injurious to trees (see label for tank-mix details). Do not use with a surfactant or within 120 days of harvest. May increase low-vigor trees' susceptibility to summer sunburn. Oregon only. Excellent control. Group M5 fungicide. 12-hr reentry. Gem 500 SC at 1.9 to 3.8 oz/A. Do not use within 60 days of harvest. Excellent protection activity and some curative activity. Group 11 fungicide. 12-hr reentry. Inspire Super at 16 to 20 fl oz/A. Do not apply within 14 days of harvest. Group 3 + 9 fungicide. 12-hr reentry. Merivon at 5 to 6.5 fl oz/A. Do not use with EC or oil-based products. Do not use within 14 days of harvest. Excellent control. Note that the product Broadform has the same active ingredients and can be used in nurseries and landscapes. Group 7 + 11 fungicide. 12-hr reentry. Ph-D WDG at 6.2 oz/A plus an adjuvant used weekly, ineffective at 2-week intervals. Limited to 3 applications per year. May be applied on the day of harvest. Group 19 fungicide. 4-hr reentry. Procure 480 SC at 4 to 6 fl oz/A. Do not apply within 18 days of harvest. Good to excellent control. Group 3 fungicide. 12-hr reentry. Propiconazole-based fungicides are registered. Applications may result in smaller, thicker, greener leaves and shortened internodes but trees will grow out of these effects within 2 weeks of the last application. Has some curative activity. Excellent control. Group 3 fungicides. 12-hr reentry. Bumper 41.8 EC at 5 to 8 fl oz/A. Propi-Max EC at 4 to 8 fl oz/A. Tilt at 5 to 8 fl oz/A. See also QuiltXcel and Stratego. Quadris Top at 12 to 14 fl oz/A. An adjuvant can be used but see label for details. Do not use within 45 days of harvest. Sprayers should not be used on apples. Excellent control. Group 3 + 11 fungicide. 12-hr reentry. Quash at 3.5 oz/A plus a surfactant. Do not make more than two (2) sequential applications or within 25 days of harvest. Group 3 fungicide. 12-hr reentry. QuiltXcel at 14 to 21 fl oz/A. Do not use within 60 days of harvest. Sprayers should not be used on apples. Group 3 + 11 fungicide. 12-hr reentry. Stratego at 12 to 15.4 fl oz/A. Do not confuse this with a similar product called Stratego YLD, which may be phytotoxic to hazelnuts. Do not use within 60 days of harvest. Group 3 + 11 fungicide. 12-hr reentry. Tebuconazole-based fungicides are registered. Do not use within 35 days of harvest. Group 3 fungicides. Tebucon 45 DF at 8 oz/A. 12-hr reentry. Unicorn DF at 3 to 5 lb/A. Group 3 + M2 fungicide. 12-hr reentry. TopGuard SC at 14 fl oz/A. Use of an adjuvant may result in Plant Growth Regulation (PGR) effects. Do not use within 14 days of harvest. Group 3 fungicide. 12-hr reentry. Topguard EQ at 5 to 8 fl oz/A. Do not use with silicone surfactants or within 45 days of harvest. Sprayers should not be used on apples. Group 3 + 11 fungicide. 12-hr reentry. Trionic 4 SC at 4 to 6 fl oz/A. Do not apply within 18 days of harvest. Good to excellent control. Group 3 fungicide. 12-hr reentry. Vacciplant at 14 to 60 fl oz/A is registered but of unknown efficacy. Must be mixed with an effective fungicide. Group P4 fungicide. 4-hr reentry. Willowood Azoxy 2SC at 6 to 12 fl oz/A. Use as a protectant only on a 10-day schedule. Do not use with a silicone-based surfactant or use within 45 days of harvest. Sprayers should not be used on apples. Moderate control. Group 11 fungicide. 4-hr reentry. Ziram 76 DF at 4 to 8 lb/A. Do not use after May. Use SLN OR-180001 for aerial application. Group M3 fungicide. 48-hr reentry. Thiram based materials (such as Thiram 24/7) used as animal repellants in the spring on the foliage of young orchards will control EFB. Do not use within 1 year of the first harvest. Notes Injection of various chemicals into trees using various techniques was not successful in reducing or eliminating canker spread within trees. Cueva is registered but was not effective in tests in western Oregon. Luna Sensation is legal to use but not recommended since only the Group 11 chemistry in this prepackaged mix is effective. The other chemical, Luna Privilege, was ineffective in field tests. The effective Group 11 chemistry is available alone as Gem and is recommended to use. Pristine is not recommended since only the Group 11 chemistry in this prepackaged mix is effective. The other chemical was ineffective in field tests. The effective Group 11 chemistry is available alone as Cabrio EG and is recommended to use. Regalia is registered but was not effective in tests in western Oregon. Some registered products offer only suppression of this disease and thus are not recommended for use. These products include Luna Experience. References Heckert, S., Pscheidt, J. W., and Cluskey, S. A. 2016. Evaluation of Chipped Cankers for Management of Eastern Filbert Blight. Plant Health Prog. doi:10.1094/PHP-RS-16-0037. Pscheidt, J.W., Heckert, S., and Cluskey, S.A. 2018. Tank Mixing Fungicides for Effectiveness Against Eastern Filbert Blight of Ha-zelnut. Plant Disease 102:919-924. Video of alternate row sparying.